In ten intergenerational events, trace the narrative of God's big story from creation to new creation. Trace God's big story from creation to new creation! Includes intergenerational events centered on creation, the fall, Abraham, the exodus, David, Jesus' birth, Jesus' ministry, Jesus' death and resurrection, the spread of the gospel, and the new heaven and new earth. Host one event a month to cover God's story in one church year, use these events for Sunday evening worship, or use the Christmas and Easter events on their own. 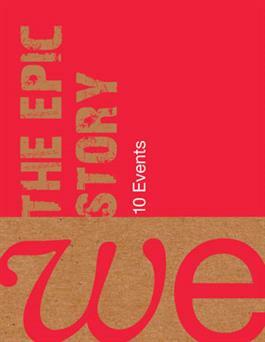 Order one box per church to get everything you need to plan and run WE: The Epic Story. ""WE: The Epic Story" is a great resource and model for the kind of short-term intergenerational learning experiences that can promote spiritual growth for adults and children. The combination of fellowship time, Scripture drama, interactive learning activities, and worship, provides a rich environment to encourage conversation on spiritual truths, reflection, prayer, and praise together. These ten sessions provide a coherent and connected overview of the story of salvation, from creation to the coming New Heaven and New Earth. This kind of overarching narrative is rare and precious for helping people understand and appreciate the message of the Bible, and the story that "we" are a part of even today. My advice to churches looking for a good resource is to try it!"